Plasmonically generated colors are unique in that the optical properties of metal nanoparticles can be tuned by changing size, shape, and material composition. While researchers have known that nanoparticles can be used in color engineering applications for many years (in fact, one of the first examples of this application is the gold nanoparticles that were used to color stained glass red in medieval times), commercial applications have been limited by the cost of plasmonics materials. Advances in scaled manufacturing processes now make it possible to incorporate these materials into paints, plastics, cosmetics, and other coatings and composites to impart unique optical properties to a wide range of materials. This module describes the unique optical properties of plasmonic nanoparticles and how they can be used to impart strong color and unique optical effects into coatings and composites. Standard commercial dyes and pigments either absorb or scatter (reflect) wavelengths of light. In order to change the color of these colorants pigment, the chemical formula must be modified. This reduces the tunability of pigments, and makes subtle changes of color difficult to engineer (typically a new molecule must be used for each new color). Additionally, pigments tend to either scatter or absorb light, but rarely do both. Nanoparticles, on the other hand, can be engineered to absorb, scatter, or both absorb and scatter. Since the particle colors depend upon size and shape, very subtle changes can be made without requiring a new formulation to be developed. If only very small changes in color are required, for example, the dimension of the nanoparticles can be increased or decreased by just a few nanometers. This level of synthetic control provides an unprecedented level of tunability which cannot be achieved using standard dye and pigment technology. 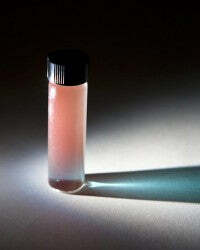 Nanoparticles appear certain colors because they reflect (scatter) and absorb specific wavelengths of visible light. 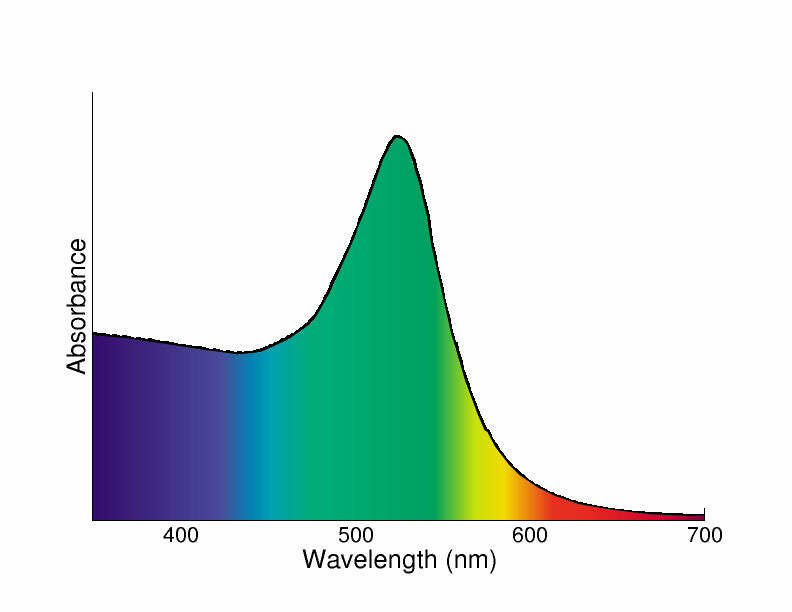 Light which appears white is a roughly equal mixture of the wavelengths of light that can be perceived by the human eye (roughly 400-750 nm, shown below). When light interacts with a nanoparticle formulation, light is either absorbed or scattered, allowing the light that continues on to reach an observers eye to appear a specific color - often referred to as the “perceived color”. The following sections describe how absorbing and scattering nanoparticles interact with light. When nanoparticles absorb light, the observer sees the light that is transmitted through the formulation, causing the observer to perceive light that is the complementary color to the absorbed color. The absorption spectrum of small gold nanoparticles is below, and shows that the particles mostly absorb in the blue and green regions of the visible spectrum. When white light interacts with these particles, blue and green light is preferentially absorbed and red light is transmitted through the material. By eye, the nanoparticle formulation then appears red, as shown below. When nanoparticles scatter light, the observer sees the light that is scattered from the nanoparticle formulation, and the perceived color corresponds to the scattered color. For example, large silver nanoparticles primarily scatter blue and green light, as shown below. When white light interacts with these particles, blue light is scattered from the material and into the eye of the observer. The scattered light from nanoparticles can be observed directly using dark field microscopy, and an image of the scattered light from 60 nm-diameter silver particles is shown below, with each blue point representing the scattered light from a single nanoparticle. Since plasmonic nanoparticles both scatter and absorb light, their perceived color is dependent on how they are viewed and their background. For example, the series of images below shows a thin film of nanoparticles on a glass substrate placed in front of black and white backgrounds. The same nanoparticles look completely different in front of a white or black background. The reason why the plasmonic particles appear different colors on different backgrounds is due to the fact that they have both scattering and absorption components within the same particle. For the case of the silver nanoparticles which have a plasmon resonance in the blue region of the spectra, on a black background, only the blue light scattered from the particles is visible; the green and red light is absorbed by the black background. However, on a white background, a portion of the blue light is absorbed while the green and red light do not interact with the particles and are reflected off the white surface which results in a yellow color. 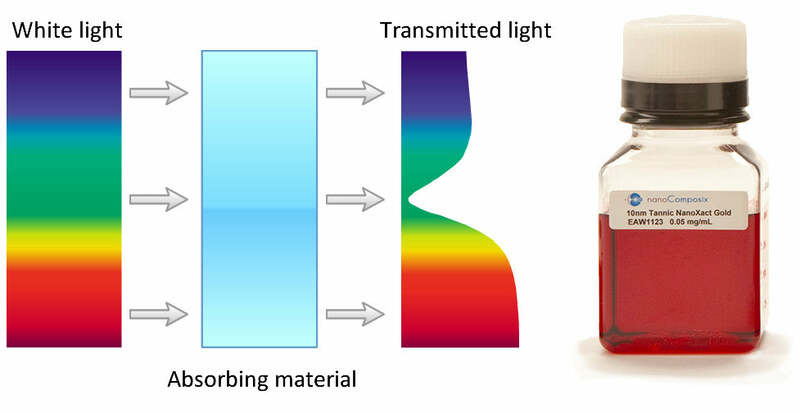 In addition to having an optical response where light is primarily absorbed or scattered, nanoparticles can be engineered to both absorb and scatter specific wavelengths of light, allowing formulations with unique color combinations to be fabricated. When a formulation can be perceived as a different color depending upon where the observer is standing (or which angle the light is shining from), we call them bichromic. An example of a solution of gold nanoshells is shown below, in which the transmitted light is mainly blue/green, while the scattered light is primarily red in color. Sun, Y., & Xia, Y. "Gold and silver nanoparticles: a class of chromophores with colors tunable in the range from 400 to 750 nm." Analyst, 128(6), 686-691 (2003). Liz-Marzán, L. M. "Nanometals: formation and color." Materials Today, 7(2), 26-31 (2004). Hsu, C. W., Zhen, B., Qiu, W., Shapira, O., Delacy, B. G., Joannopoulos, J. D., & Soljacic, M. "Transparent displays enabled by resonant nanoparticle scattering." Nature Communications, 5, 3152 (2014). For more information on selecting particles for your research or applications please contact us.